When LeBron James left the Eastern Conference, it was assumed that the Boston Celtics would take the mantle of the Best Team in the East. How could they not be the favorites? They pushed King James to the limit in the Eastern Conference Finals without Kyrie Irving and Gordon Hayward. This season, the two All-Stars were returning to a team stacked with young talent that had deep Playoff experience. Their head coach Brad Stevens is widely considered a wizards who manufactures plays out of thin air. They had all the tools to be an elite team not only in the East, but in the NBA. However, early season returns haven’t matched the preseason expectations. Other Eastern contenders have emerged in Toronto with Kawhi Leonard and Milwaukee with a revamped offense. The Bucks have zoomed to the top of the standings with seven straight wins, including one over the Raptors earlier this week. Facing the current top team in the East, the Celtics showed just how good they can be. 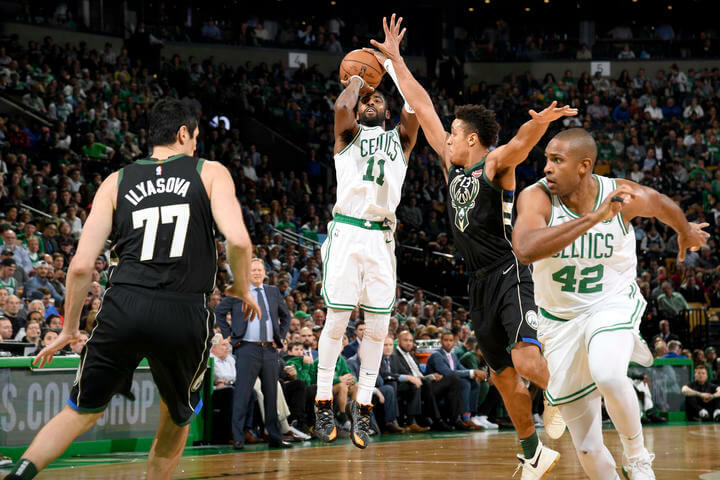 Boston uncorked a franchise record 24 three-pointers to showcase the full strength of their offense. They hit 43% of their outside shots launching 55 attempts during the game. Boston also assisted on 30 of their 41 made field goals. After early-season offensive struggles, the Celtics proved that their offense is just fine. They’re still trying to figure out how to reincorporate two All-Stars back into their line-up. So there are still growing pains. But in the game against the Bucks, they proved that they need their All-Stars for an offensive punch when the shots aren’t falling for their young guns. With Jayson Tatum, Jaylen Brown, Terry Rozier and Macus Smart all off. Kyrie Irving took the scoring load with 28 points and six treys. Gordon Hayward also played his best game since his return with 18 points, four rebounds and five dimes with three treys. The Celtics are now second to the Raptors and Bucks at 6-2. They’re slowly making their way back to the top of the East where they belong. Well, Russ did make sure of it. The Thunder have now won three straight games and are moving up the Western Conference totem pole. Their latest win came over the Charlotte Hornets where Westbrook had another full line. He had 29 points, 10 assists and eight rebounds. He came up big in the clutch scoring on key drives to the hoop to put the game away. During their three-game run, Westbrook has averaged 28 points, eight assists and seven assists. Yup. He did make sure of it. In the same way Westbrook breathes life into the OKC offense, De’Aaron Fox is also starting to become the engine of the Sacramento Kings. Against the Hawks, Fox put up Westbrook-like numbers with 31 points, 10 rebounds and 15 assists. The Kings put up 146 points against the hapless Hawks with Fox leading the way. Sacramento is now at 6-3 and at fifth in the West. They’re outplaying their preseason projections and accelerating their growth so far this season.